Revive your casual wear with Dieselâ€™s streetwear-inspired staples. Choose from re-worked basics, luxe knits, graphic tees, premium denim and casual outerwear. 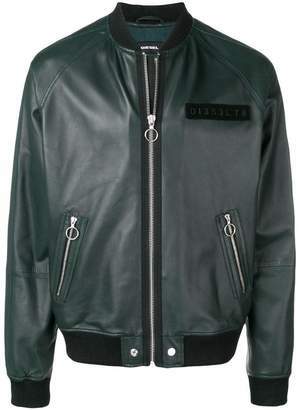 This green sheepskin L-Pins-A leather jacket features a ribbed shawl collar, a front zip fastening, a logo to the chest, side zipped pockets, long sleeves and a ribbed hem and cuffs.